⬛ The next strata, thought to have been composed during the exilic to early post-exilic period (571–486 BCE) is, as Dr. Yoreh explains, “responsible for supplementing the ‘J’ narrative with dates, names, and numbers, thus ‘ordering’ and authenticating ‘J’s account.” This layer, commonly referred to as ‘P’ (for ‘Priestly’) appears here in GREEN text. Parashat B’shalaḥ (Exodus 13:17-17:16) in the annual Torah reading cycle, is read on the second shabbat of the month of Shvat. The parashah is preceded by parashat Bo (Exodus 10:1-13:16); parashat Yitro (Exodus 18:1-20:22) follows it. 20 They moved on from Sukkot and encamped in Etam at the edge of the wilderness. 21 Now YHVH goes before them, by day in a column of cloud, to lead them the way, by night in a column of fire, to give light to them, to (be able to) go by day and by night. 22 There does not retire the column of cloud by day or the column of fire by night from before the people! 14 1 YHVH spoke to Mosheh, saying: 2 “Speak to the Children of Yisrael, that they may turn back and encamp before Pi Ha-Hirot, between Migdol and the sea, before Baal-tsefon, opposite it, you are to encamp by the sea. 3 Now Pharaoh will say of the Children of Yisrael: ‘They are confused in the land! The wilderness has closed them in!’ 4 I will make Pharaoh’s heart strong-willed, so that he pursues them, and I will be glorified through Pharaoh and all his army, so that Mitsrayim may know that I am YHVH.” They did thus. 5 Now the king of Mitsrayim was told that the people fled, and Pharaoh’s heart and (that of) his servants changed regarding the people, they said: “What is this that we have done, that we have sent free Yisrael from serving us?” 6 He had his chariot harnessed, his (fighting-) people he took with him, 7 and he took six hundred selected chariots and every (kind of) chariot of Mitsrayim, teams-of-three upon them all. 8 Now YHVH made the heart of Pharaoh king of Mitsrayim strong-willed, so that he pursued the Children of Yisrael, while the Children of Yisrael were going out with a high hand. 9 The Mitsrim pursued them and overtook them encamped by the sea, all of Pharaoh’s chariot-horses, his riders, and his army, by Pi Ha-Hirot, before Baal-tsefon. 13 Mosheh said to the people: “Do not be afraid! Stand fast and see YHVH’s deliverance which he will work for you today, for as you see Mitsrayim today, you will never see it again for the ages! 14 YHVH will make war for you, and you – be still!” 15 YHVH said to Mosheh: “Why do you cry out to me? Speak to the Children of Yisrael, and let-them-march-forward! 16 And you – hold your staff high, stretch out your hand over the sea and split it, so that the Children of Yisrael may come through the midst of the sea upon the dry-land. 17 But I, here, I will make Mitsrayim’s heart strong-willed, so that they come in after them, and I will be glorified through Pharaoh and all his army, his chariots and his riders; 18 the Mitsrim shall know that I am YHVH, when I am glorified through Pharaoh, his chariots and his riders.” 19 The messenger of Elohim that was going before the camp of Yisrael moved on and went behind them, the column of cloud moved ahead of them and stood behind them, 20 coming between the camp of Mitsrayim and the camp of Yisrael. Here were the cloud and the darkness, and (there) it lit up the night; the-one did not come near the-other all night. 26 Then YHVH said to Mosheh: “Stretch out your hand over the sea, and the waters shall return upon Mitsrayim – upon its chariots and upon its riders.” 27 Mosheh stretched out his hand over the sea, and the sea returned, at the face of dawn, to its original-place, as the Mitsrim were fleeing toward it. And YHVH shook the Mitsrim in the midst of the sea. 28 The waters returned, they covered the chariots and the riders of all of Pharaoh’s army that had come after them into the sea, not even one of them remained. 29 But the Children of Yisrael had gone upon dry-land, through the midst of the sea, the waters a wall for them on their right and on their left. 30 So YHVH delivered Yisrael on that day from the hand of Mitsrayim; Yisrael saw Mitsrayim dead by the shore of the sea, 31 and Yisrael saw the great hand that YHVH had wrought against Mitsrayim, the people held YHVH in awe, they trusted in YHVH and in Mosheh his servant. he has become deliverance for me. 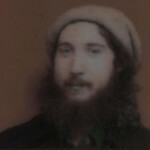 the elo’ah of my father – I exalt him. his choicest teams-of-three sank in the Sea of Reeds. they went down in the depths like a stone. your right-hand, O YHVH, shattered the enemy. you sent forth your fury, consumed them like chaff. the oceans congealed in the heart of the sea. my sword I will draw, my hand – dispossess them! they plunged down like lead in majestic waters. 11 Who is like you among the elim, O YHVH! Feared-one of praises, Doer of Wonders! guided (them) in your fierce-might to your holy pasture. then melted away all K’naan’s settlers. before your arm’s greatness they grew dumb like stone. until they crossed – the people you fashioned. the Holy-shrine, O Lord, founded by your hands. 18 Let YHVH be king for the ages, eternity! 19 For Pharaoh’s horses came with (their) chariots and riders into the sea, but YHVH turned back the sea’s waters upon them, and the Children of Yisrael went upon the dry-land through the midst of the sea. 22 Mosheh had Yisrael move on from the Sea of Reeds, and they went out to the Wilderness of Shur. They traveled through the wilderness for three days, and found no water. 23 They came to Marah, but they could not drink water from Marah, because it was mar/bitter. Therefore they called its name Marah. 24 The people grumbled against Mosheh, saying: “What are we to drink?” 25 He cried out to YHVH, and YHVH directed him (to some) wood which he threw into the water, and the water became sweet. – There he imposed law and judgment for them, and there he tested them. 27 They came to Elim; there were twelve springs of water and seventy palms, and they camped there by the water. 13 Now it was at sunset a horde-of-quail came up and covered the camp. And at daybreak there was a layer of dew around the camp; 14 and when the layer of dew went up, here, upon the surface of the wilderness, something fine, scaly, fine as hoar-frost upon the land. 15 When the Children of Yisrael saw it they said each-man to his brother: “Mahn hu/what is it?” For they did not know what it was. Mosheh said to them: “It is the bread that YHVH has given you for eating. 16 This is the word that YHVH has commanded: ‘Glean from it, each-man according to what he can eat, an omer per capita, according to the number of your persons, each-man, for those in his tent, you are to take. '” 17 The Children of Yisrael did thus, they gleaned, the-one-more and the-one-less, 18 but when they measured by the omer, no surplus had the-one-more, and the-one-less had no shortage; each-man had gleaned according to what he could eat. 19 Mosheh said to them: “No man shall leave any of it until morning.” 20 But they did not hearken to Mosheh, and (several) men left some of it until morning; it became wormy with maggots and reeked. And Mosheh became furious with them. 21 They gleaned it in the morning, (every) morning, each-man in accordance with what he could eat, but when the sun heated up, it melted. 22 Now it was on the sixth day that they gleaned a double-portion of bread, two omers for (each) one. All the exalted-leaders of the community came and told it to Mosheh. 23 He said to them: “It is what YHVH spoke about: tomorrow is a Shabbat/Ceasing, a Shabbat of Holiness for YHVH. Whatever you wish to bake – bake, and whatever you wish to boil – boil; and all the surplus, put aside for yourselves in safekeeping until morning.” 24 They put it aside until morning, as Mosheh had commanded, and it did not reek, neither were there any maggots in it. 25 Mosheh said: “Eat it today, for today is a Shabbat for YHVH, today you will not find it in the field. 26 For six days you are to glean, but on the seventh day is Shabbat, there will not be (any) on it.” 27 But it was on the seventh day that some of the people went out to glean, and they did not find. 28 YHVH said to Mosheh: “Until when will you refuse to keep my commandments and my instructions? 29 (You) see that YHVH has given you the Shabbat, therefore on the sixth day, he gives you bread for two days. Stay, each-man, in his spot; no man shall go out from his place on the seventh day!” 30 So the people ceased on the seventh day. 31 Now the House of Yisrael called its name: ‘Mahn.’ – It is like coriander seed, whitish, and its taste is like (that of) a wafer with honey. – 32 Mosheh said: “This is the word that YHVH has commanded: An omer of it for safekeeping throughout your generations, in order that they may see the bread that I had you eat in the wilderness when I brought you out of the land of Mitsrayim.” 33 Mosheh said to Aharon: “Take a vat and put an omer of mahn in it, and put it aside in the presence of YHVH, in safekeeping throughout your generations.” 34 As YHVH had commanded Mosheh, Aharon put it aside before the Testimony, in safekeeping. 35 And the Children of Yisrael ate the mahn for the forty years, until they came to settled land, the mahn they ate, until they came to the edge of the land of K’naan. 36 Now an omer – it is a tenth of an efa. 8 Now Amaleq came and made-war upon Yisrael in Refidim. 9 Mosheh said to Yehoshua: “Choose us men, and go out, make-war upon Amaleq! On the morrow I will station myself on top of the hill, with the staff of Elohim in my hand.” 10 Yehoshua did as Mosheh had said to him, to make-war against Amaleq. 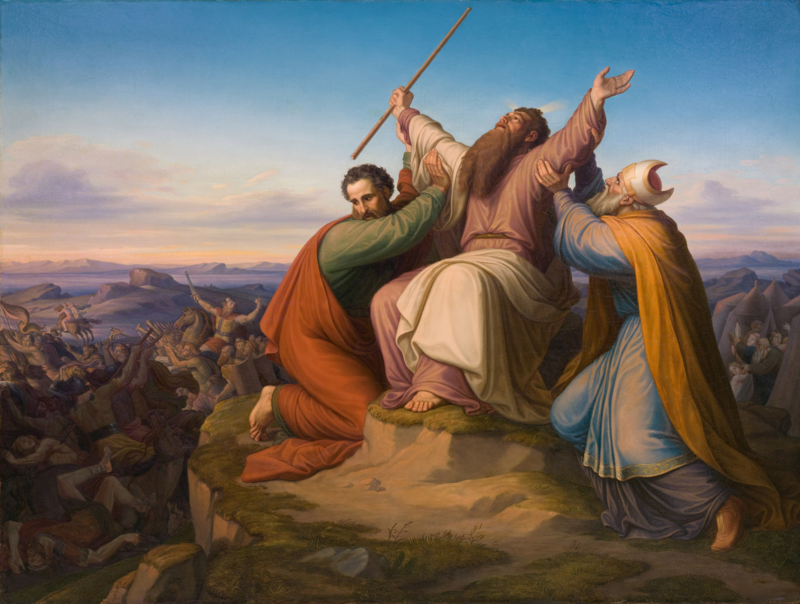 Now Mosheh, Aharon and Ḥur went up to the top of the hill. 11 And it was, whenever Mosheh raised his hand, Yisrael prevailed, and whenever he set down his hand, Amaleq prevailed. 12 Now Mosheh’s hands are heavy; so they took a stone and placed it under him, and he sat down on it, while Aharon and Ḥur supported his hands, one on this-side and one on that-side. So his hands remained steadfast, until the sun came in. 13 And Yehoshua weakened Amaleq and his people, with the edge of the sword. 14 YHVH said to Mosheh: “Write this as a memorial in an account and put it in Yehoshua’s hearing: ‘Yes, I will wipe out, wipe out the memory of Amaleq from under the heavens! '” 15 Mosheh built a place-for-slaughter and called its name: ‘YHVH My Banner.’ 16 He said: “Yes, Hand on YAH’s throne! War for YHVH against Amaleq generation after generation! The Masoretic text presented here is from Rabbi Dr. Seth (Avi) Kadish’s Miqra al pi ha-Mesorah. For the translation in English, I have adapted the translation of Everett Fox in the Schocken Bible (1997), mostly to re-Hebraize divine names, place names, and personal names. Instead of Fox’s “slaughter-site,” I have translated mizbeaḥ as “place-for-slaughter.” Instead of “prophetess” for Miriam, I have “prophet.” Aside from these, I have made minor punctuation changes. “פָּרָשַׁת בְּשַׁלַּח | Parashat B’shalaḥ (Exodus 13:17-17:16), color-coded according to its narrative layers” is shared by Aharon N. Varady (transcription) under the contributor's Fair Use Right (17 U.S. Code §107 - Limitations on exclusive rights: Fair use), in respect to the copyrighted material included. Any additional work that is not already in the Public Domain is shared under a Creative Commons Attribution 4.0 International license. The textual source called 'E' is the earliest of all literary sources in the Torah, the kernel from which all other narratives expanded upon. E was composed in the mid- to late eighth century BCE, toward the end of the heyday of the northern Ephraimite Kingdom, one of the two kingdoms that occupied Biblical Israel. The Kingdom of Ephraim was the larger and more urban of the two, and had its capital in Samaria, the city after which the Samaritans are named. To its south lay the smaller, but better-known Kingdom of Judah, whose capital city was Jerusalem. It seems likely that E was composed during this period because it marked the first literary flowering in ancient Israel. We know this based on the books of Amos and Hosea, composed at about that time, and from a wealth of inscriptions that we can confidently date to that period. The book of E, so called because it uses Elohim as its exclusive name for the deity of the Pentateuch, is composed of five story cycles focusing on five early Israelite heroes: Avraham, Yaakov, Yosef, Moshe, and Bilaam. The stories of Avraham and Bilaam are placed at the beginning and end of the Elohistic document, respectively, so that the two men can serve as models for how one should fear the remote and awesome God of the Elohistic source. The Yaakov, Yosef, and Moshe cycles, which comprise the bulk of the E narrative, chronicle Israel’s metamorphisis from a family into a people. Composed in the late eighth or early seventh century BCE in the southern Kingdom of Judah, 'J' is one of the primary sources of the Masoretic text of the the Hebrew Bible, The J source was responsible for the first major metamorphosis of the oldest recognized kernel of the Biblical narrative (known as the E source). By combining the book of E, the Book of the Covenant (a law code found in Exodus 21–24), and the northern book of Judges (predecessor to the canonical book of Judges), and supplementing them with J's own text, J composed a cohesive historical work which chronicles the events from the creation of the world to the crowning of King David in nine story cycles, focusing on the Israelite line. J’s editorial style is highly invasive. In adding their own voice to that of their predecessor E, J often overwhelms the reader with their point of view to the extent that E’s original narrative threads are no longer apparent. The last major addition to the biblical text was a post-exilic (pre-3rd century BCE) source which Dr. Tzemaḥ Yoreh refers to as the "Bridger" or simply, 'B.' B supplements earlier layers of text with genealogies and popular myths, providing narrative bridges between distant story cycles. B's narrative additions often share a fantastic element rarely found in Biblical narrative, and are most likely later additions to their respective Pentateuchal frameworks. Please reciprocate for any adaptation or redistribution of this work by (1) properly attributing the work to Aharon N. Varady (transcription), Tzemaḥ Yoreh, the Masoretic Text, Masoretic kernel 'E', Masoretic layer 'J', Masoretic layer 'P', Masoretic layer 'H' and Masoretic layer 'B', (2) clearly indicating the date you accessed the resource and whether any changes have been made (and if so, please be in touch with us and leave a comment below so that we might note your adaptation or improvement), (3) providing a link back to this source, and (4) specifying the Fair Use Right (17 U.S. Code §107 - Limitations on exclusive rights: Fair use) under which this work was shared.